On Tuesday, the parks began taking digital pictures of visitors using multiday passes and putting them in their computers. That way, Disney employers can check the pictures against the tickets as those visitors enter Disneyland or Disney California Adventure. Both children and adults are photographed. The photos are erased when the tickets expire. Suzi Brown, a Disneyland Resort spokeswoman, said the parks are testing out the practice as a way to prevent businesses from renting out multi-day passes by the day at discounted rates. 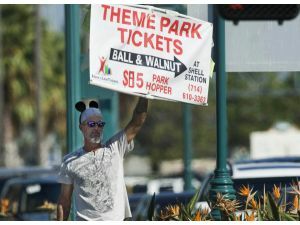 The practice was legal but violated Disney's policy, which states that Disney's tickets are nontransferable and must be used by the same person each day. Until last fall, Disney would only check identification sporadically, so most visitors using those discounted passes got away with it. Then Disney began checking identification regularly, and some of the businesses have shut down. Brown said the picture-taking is the same process that Disney has used for annual passholders, whose photos also are checked as they enter the park.